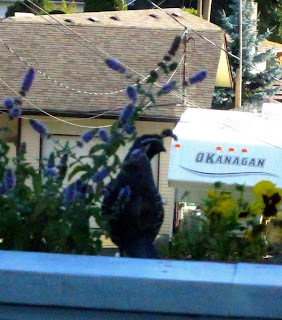 King Arthur Quail strode across our balcony deck as if he owned the joint, then flew- hopped onto my flowering mint box to perch on the railing. From his vantage point, he could survey his kingdom a good 14 feet below and keep a watchful eye on his Queen Guinevere, who was next door, teaching the juvies how to hunt and scratch in the burned mound left over from the neighbour's attempt to get rid of weeds (he used a blowtorch). There was quite the conversation going on: I can just imagine what they thought! Blessings of Quail Courts to all that have these delightful birds in their yards.